Frequently in the global economy, it seems that corporations are able to get away with activities which would see an individual locked up in the Hague for decades. Take the case of Caterpillar. Without selling a single bomb, gun or F16 fighter, Caterpillar has been supplying the Israeli military with its “key weapon”, in the words one Israeli commander, in its illegal and brutal occupation of Palestine. In the words of the United Nations Special Rapporteur on the right to food, Caterpillar’s D-9 bulldozers have been responsible for destroying “agricultural farms, greenhouses, ancient olive groves.. numerous Palestinian homes and sometimes human lives”. Caterpillar’s D9 bulldozers have been the weapon of choice to carry out some of the worst human rights violations witnessed during the Intifada. In Jenin camp, home to 14,000 refugees, bulldozers were a key component of Operation Defensive Shield, the “most extensive and severe” human rights violation since 1967 (B’Tselem). Hawashin district of the camp was levelled down to the last house, with many residents given no notice of demolition. Many were buried alive, including 38-year-old paraplegic Jamal Suliman. 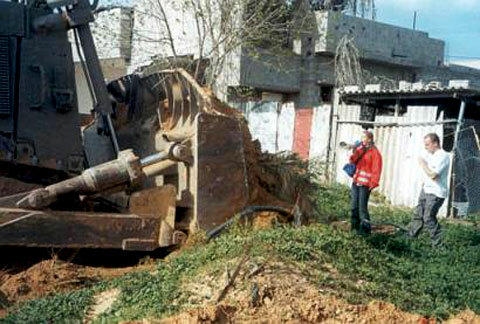 In his mother’s words “the bulldozer wouldn’t wait even one minute so that we could take Jamal out of the house”. 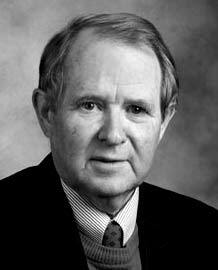 During a similar raid on a refugee camp in Rafah in May 2004, United Nations Special Rapporteur on human rights John Dugard noted “Homes have been destroyed in a purely purposeless manner. Bulldozers have savagely dug up roads, including electricity, sewerage and water lines, in a brutal display of power”. In total 298 homes were destroyed in Rafah in a single month. But perhaps the bulldozers are best described by the experiences of two young people on either side of the Occupation. Israeli Army D9-operator Moshe Nissim describes his experience of Jenin: “I had no mercy for anybody. I would erase anyone with the D9 … when I was told to demolish a house, I took the opportunity to bring down some more houses”. His unit was cited for outstanding service. Rachel Corrie (L) and Nick (R) oppose the potential destruction of this home (to the west of the Doctor’s home where Rachel was killed). 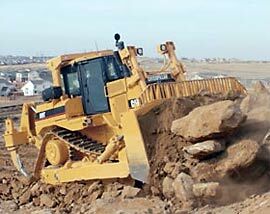 In the instance pictured, the Caterpillar D-9 bulldozer did not stop and Rachel was pinned between the scooped earth and the fence behind her. On this occasion, the driver stopped before seriously injuring her. Picture taken between 3:00-4:00PM, 16 March 2003, Rafah, Occupied Gaza. 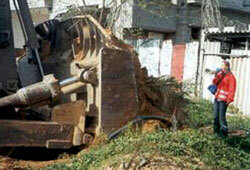 Family of Rachel Corrie files suit against Caterpillar, Inc.
Picture taken between 3:00-4:00PM, 16 March 2003, Rafah, Occupied Gaza. Rachel Corrie opposes the potential destruction of this home (to the west of the Doctor’s home where Rachel was later killed). In the instance pictured, the bulldozer did not stop and Rachel was pinned between the scooped earth and the fence behind her. On this occasion, the driver stopped before seriously injuring her. March 15, 2005, New York, NY — The Center for Constitutional Rights (CCR) and partnering law firms today filed a federal lawsuit against Illinois-based Caterpillar, Inc. on behalf of the parents of Rachel Corrie, the 23-year-old American peace activist and student who was run over and killed by a Caterpillar D9 bulldozer on March 16, 2003. The suit, filed in the U.S. District Court for the Western Federal District of Washington, alleges that Caterpillar, Inc. violated international and state law by providing specially designed bulldozers to Israeli Defense Forces (IDF) that it knew would be used to demolish homes and endanger civilians. The Corries’ daughter Rachel, a student at The Evergreen State College in Olympia, Washington, was there as a volunteer peace activist protesting the demolition of Palestinian homes when she was brutally killed. Much of the world community, including international human rights organizations and the United Nations, has consistently condemned these demolitions as a clear violation of international humanitarian law. The Corries also filed a tort claim today in Israel against the State of Israel, the Israeli Defense Ministry and the IDF for their role in the death of their daughter. They are represented by Advocate Hussein Abu Hussein. Over the past four years, the IDF has used Caterpillar bulldozers to destroy more than 4,000 Palestinian homes, injuring, killing, or leaving homeless scores of individuals in the process. Rights groups have sent over 50,000 letters to Caterpillar, Inc. executives and CEO Jim Owens, decrying the use of Caterpillar bulldozers to carry out human rights abuses. Plaintiffs Craig and Cindy Corrie are represented by lawyers from the Center for Constitutional Rights, the Ronald J. Peterson Law Clinic at Seattle University Law School, and the Public Interest Law Group PLLC in Seattle, Washington.